In a cheering atmosphere yesterday, the Executive Chairman, Agboyi-ketu LCDA, Mayor Dele Oshinowo marked the commemoration of his six months in office. The program was held at the council headquarters, Agboyi road, Alapere. Speaking at the program, the chairman saluted the good people of the local council for their unwavering support throughout the stipulated time. While assuring them of the administration’s commitment to dot every nook and cranny with developmental projects, the chairman leveraged on the program to reel out a comprehensive report of his stewardship so far. Notably, the chairman identified the ultra modern L-shaped two storey office complex, rehabilitated roads in ile-ile and her environs,Ibefun Street and her environs, distribution of GCE forms to indigent students, the Agboyi-Ketu Bursary Scheme, and awareness programme on Lasaa fever, monkey pox and other communicable diseases. Likewise, other highlights are the launching of Agboyi-Ketu Waste Intervention Program, Maiden Agboyi-Ketu Table Tennis Championship, Agboyi-Ketu Monthly Fitness Walk among other notable achievements. He described the achievements as a reward for partnership, affirming further that it is as a starter pack that will solidify the foundation level for trust and inclusiveness. On presentation of Bursary Award, the chairman disclosed that the scheme was aimed at opening a new paragraph in the educational life of the local council. He charged the beneficiaries to remain good ambassadors, and advised them to shun any form of social vices. ” Above all, I appeal to you to remain good ambassadors of your home, our communities and our nation. Your sacrifice and pain in focusing on your studies when it matters now, will surely help you to build your future and consolidate it with gainful opportunities”. Similarly, a board member, Lagos State Audit Commission, Hon Abiodun Akhigbe, whom flagged off the presentation of cheques to the awardees appealed to the undergraduate students to remain committed to their educational pursuit. In a show of appreciation, Miss Oluwatobi Mojisola, on behalf of her fellow beneficiaries, thanked the chairman for the gesture, promising him of their commitment to attain the top. 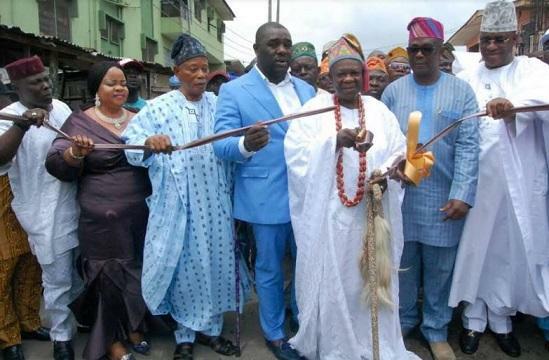 In his remarks, the Deputy Senatorial Leader, All Progressives Congress (APC), Pa Stephen Oyedele said he was delighted to witness the triumphant achievements of the Mayor Dele Oshinowo led-administration. He further charged him to remain patriotic in the discharge of his duties, stressing that the achievements in office will be a great plus for the All Progressives Congress come 2019. The honorable member repesenting Kosofe Constituency 2 in the Lagos State House of Assembly, a one time chairman of Kosofe Local Government, Hon. Tunde Braimoh hailed the chairman and the residents of the local council for the remarkable success. Also,the first executive chairman of the local council ,Otunba (Mrs) Yetunde Arobieke commended the chairman for the plethora of achievements, she appealed to the residents to remain supportive of him. Immediately after the disbursement of bursary funds, the chairman led a procession to the commissioning points of notable projects. The new office complex was commissioned by wife of the Apex Leader, Greater Kosofe APC, Alhaja Mariam Osinowo, rehabilitated roads in Ile-Ile and her environs was commissioned by Pa Stephen Oyedele. While Alhaji Lawal Street was commissioned by Alaketu of Ketu, Oba Isiaka Oyero, Ibefun and Ijagun Streets, both located in Alapere respectively was commissioned by Hon. Tunde Braimoh and Ogunjobi Oriwu Street, Alapere was commissioned by Otunba Yetunde Arobieke. The post Oshinowo marks six months in office, promises more developments appeared first on Vanguard News.